Owls, the most fascinating of all birds, have captivated peoples' imaginations for centuries. Their association with wisdom, their inscrutible gaze and their nocturnal activities give them an air of mystery. This book contains information that tell you all you need to know about ... read full description below. 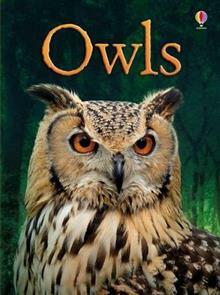 Owls, the most fascinating of all birds, have captivated peoples' imaginations for centuries. Their association with wisdom, their inscrutible gaze and their nocturnal activities give them an air of mystery. This book will give you a surprising amount of information, and tell you all you need to know about the many different types of owls and how they live. It is part of an extensive series of easy-reading reference books.